There are multiple possible Causes of Osteoporosis. 'Aging' is not one of them. Osteoporosis is not a 'disease'. It is a predictable outcome created by certain predictable and measurable factors. Osteoporosis does not happen by 'default' and no human is 'doomed' to suffer from it. It happens for specific reasons. Specific factors cause osteoporosis. Avoid those factors, and/or reverse those factors. The usual claims of what you'll find on the internet and from the mouths of doctors is that menopause and decreased estrogen is the primary cause of osteoporosis, and that lack of calcium is also a primary driver. Common 'wisdom' is that osteoporosis is a disease, and that it is usually caused by the decrease in estrogen caused by menopause. Estrogen replacement therapy and calcium supplementation has been the prevalent treatment. But even though it is common and believed by the majority of doctors, this 'wisdom' is flawed. There is little to no debate on what makes up the Signs And Symptoms Of Osteoporosis. And not enough of debate on the actual osteoporosis causes. Doctors will tell you that lack of calcium is to blame. But that's just medical habit, and not actually based on research or common sense. Obviously with malnourishment one can have a lack of calcium, but that is not the case with the vast supermajority of people in the Western World suffering from osteoporosis. It's mostly women that doctors see with osteoporosis. And women get menopause, which disrupts/drops estrogen levels. And estrogen is an important part of the bone building/formation mechanism (especially as we are young and our bodies are growing/developing. So it makes sense that menopause and estrogen drops would be to blame. And to a small extent it is, but it's not a primary driver as your doctor will tell you. And age, well, we're all getting older. But 'you're just getting old' is a statement that if you hear it from your doctor should be a huge clue to get up, leave the room, and never come back. 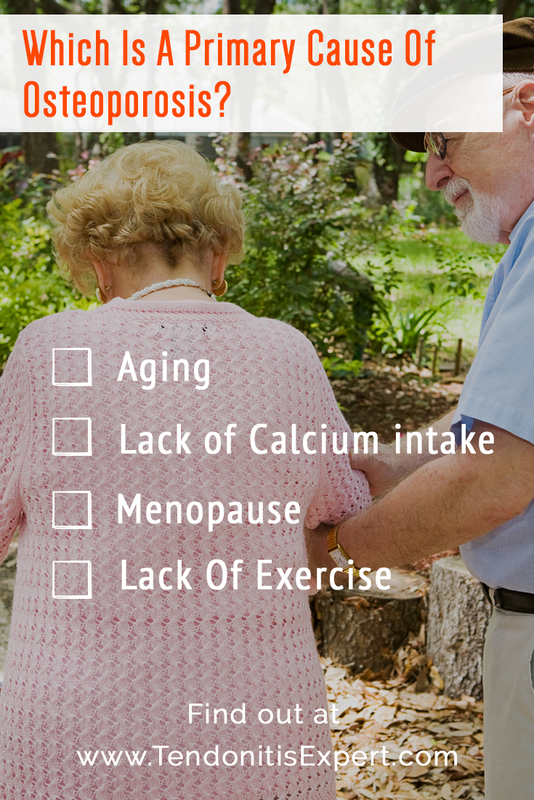 See more below about calcium, estrogen, and aging as purported causes of osteoporosis. And then there are the more accurately labeled causes of Osteoporosis. The body forms itself to the forces placed upon it. Sedentary lifestyles tells the body that it doesn't need strong bones. Various over the counter and prescription medicines directly and/or indirectly cause osteoporosis. And if one take lots of calcium but not enough of the right kinds of other nutrition, then the body can't use that calcium. There is a lot of medical mythology in the world of health care. Lucky you, you get to sift through it. Lack of calcium as a cause of osteoporosis is a big one. 'Aging' as a cause is a total myth. Menopause and Estrogen has a certain degree of accuracy but still isn't a primary driver in the loss of bone density. The US as a nation, last I looked, was top of the list for Osteoporosis rates and top of the list for Calcium supplementation. If Calcium intake fixed Osteoporosis, we wouldn't be at the top of the list for osteoporosis rates. So despite doctors continuing to prescribe calcium supplementation being a failed treatment option, the prescriptions continue. Mostly, we get plenty of calcium in our diets, even on the Standard American Diet (SAD). But we don't get enough of other necessary nutrition that is required for the body to be able to utilze the calcium that does come in. It's mostly older women that suffer from Osteoporosis. And menopause looks like a strong correlative factor. But, look at the conclusions of the results from this long term study on 670 white women. "In the women less than 75 years of age who had taken estrogen for seven or more years, the bone density was 11.2 percent greter than in woen who had never received estrogen. Among women 75 years of ange and older in whome the duration of therapy was comparable, bone density was only 3.2 percent higher than in women who had never taken estrogen." So post-menopausal women under 75 who took estrogen for 7 years had a bone density of ONLY 11.2% higher than women who did not take estrogen. Post-menopausal women over 75 years of age who took estrogen for 7 years had a bone density ONLY 3.2% higher that peers who had never taken estrogen. 11.2% stronger bones is better than nothing, but 3.2% pretty much isn't. Estrogen helps and in general is important in the prevention of the body resorbing calcium from bones. But (and there's more going on there, of course) estrogen is clearly not the MAIN factor in the osteoporosis mechanism. Nope. No it does not. Let's look at this other bit of common 'wisdom'. "However, as we age, the rate of bone breakdown can outstrip bone-building, with a peak in bone density in the late twenties, and a gradual weakening after the age of 35 or so; in some people, this natural weakening is more pronounced, leading to osteoporosis and a higher risk of fractures"
Age is not one of the causes of osteoporosis. Sorry. It's true that the more we 'bank' strong bones in our youth then the longer our bones can go (losing mass/density) until we have problems. But that's a cop out. It doesn't ask WHY we grow bone slower when we're older than when we're younger. Yes, youth has a certain vitality to it that we lose as we age. There's no arguing that. But here we're talking bone DENSITY, and really, going through life without bone pain or bone fractures. That's got nothing to do with aging. Keeping our bones strong and healthy is. The human body is a machine. Yes there's a lot of Woo Woo mixed in there, with spirituality of the body and the mind/body connection, but for this conversation let's go with that the body is like a very complicated car. It works how it works, and you can alter it's function by adding or subtracting, or putting in the wrong kind of gasoline, or too much or not enough air in the tires. Point being, when a car stops working, or starts to not work very well, there are specific reasons for that. So, what are some actual causes of Osteoporosis? Lack of the correct kinds of exercise. Medications that cause an osteoporosis dynamic. Lack of the right nutrition. The body responds in kind to whatever stresses are placed upon it. Sedentary lifestyles cause a body to be (literally) weak. The right kinds of exercise cause the body to trigger mechanisms that make bones stronger/denser. Exercise alone won't prevent osteoporosis but exercise alone can help slow the progression of it. More on that in the 'right nutrition' part below. Certain medications can cause osteoporosis, in a variety of ways. Whether by depleting nutrition, or affecting hormonal function, or blocking calcium utilization, those aren't the only ways that osteoporosis is caused by medications. That conversation deserves it's own page. Well, it helps cause osteoporosis anyway. Sugar causes inflammation. Inflammation eats up necessary nutrition. Sugar replaces necessary nutrition intake. So you have less going into your body. Sugar steals necessary nutrition. So it's not available to you. Ultimately, sugar leaves you with a lack of the right nutrition necessary for strong bones. Lack of adequate nutritional intake (and lack of exercise in the elderly decades, is the main cause of osteroporosis in men. In the western world we all get enough calcium from our diets, even from the SAD Standard American Diet. But we don't get enough of the necessary nutrition that are required for our bodies to utilize that calcium. So then, still wanting/needing that calcium, our bodies trigger a mechanism that pulls calcium from our bones. Until we get enough of the right nutrition into our bodies so we can utilize the calcium. Then and only then will calcium stop being pulled from our bones, and put back into our bones. What is your Vitamin D level? Don't know? Find out. Vitamin D is a vital part of the osteoporosis mechanism. Well, lack of Vitamin D is, anyway. Magnesium is another core requirement. Vit D and Magnesium both are required for your body to utilize the calcium in takes in via diet, AND both are required for strong bones. Interestingly enough, osteoporosis causes higher nutritional needs as well, ironically. As a Pain Causing Dynamic kicks in, other stressors come in to play, and that eats up nutrition helping make you short on what you need. Of all the causes of osteoporosis, lack of proper nutritional intake is at the top of the list. Return to the top of this Causes Of Osteoporosis page.